Clapham Nature Trail and Ingleborough Show Cave. We parked on the National Park’s Car park in the village, which is quite expensive so bring plenty of change. From there we walked past the church and followed the brook to the beginning of the nature trail, which is well sign posted. There is an honesty box for contributions toward its upkeep. One end of the lake. We put Hugo on his lead in the woodland and kept to the main path, as he is one for wandering ! I would have loved to have explored a bit more and discovered Reginald’s collection of exotic plants. Instead we made do with our own beautiful native wildflowers, which are abundant on the trail. The building above is known as ‘The Grotto’ and was built in the 19th Century to shelter those who wanted to sit back and admire the scenery. After the woodland, the landscape opens out onto limestone pastures ,so we let Hugo have a play in the babbling brook. 🙂 As you can see the path is pretty decent and is so all the way along. I would definitely say that it is suitable for prams, pushchairs, wheelchairs etc. The Entrance to the Cave soon comes into sight! I go and investigate the little shop and it seems a tour is about to start in 5 minutes. There are only two other couples putting on hard hats , so we decide to go for it. Hugo does not have to wear a hat , though I think it would have suited him. ;). 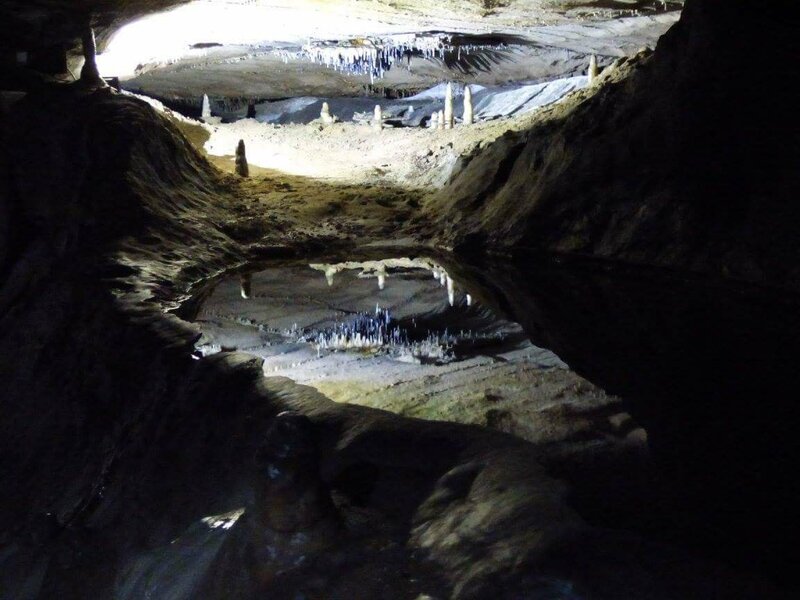 Our Guide ‘Jude’ was really enthusiastic and regaled us with the history of Ingleborough Show Cave and how it to was first explored in 1837 by members of the Farrer family, after a massive flood revealed it. The intrepid Victorians made their staggering discoveries dressed in tweed and carrying candles! Stalagmites and stalactites galore. Today the cave retains its treasures for everyone to view and the interesting tour is well worth the £9 charge. The reflection looks like a tiny city. We really enjoyed our exploration of Ingleborough Cave. The tour is well lit and there is a concrete path to follow. There is quite a bit of head ducking , so be warned if you are pretty tall! Afterwards we warmed up with hot drinks and made our way back to Clapham, via the trail. It was wonderful to catch the odd glimpse of dippers darting up the stream. 🙂 Of course if you want to carry on over the pack horse bridge and up to Gaping Gill ( a natural pothole cave), there is more to discover……. And two inquisitive pugs woofed their goodbyes from a Clapham Village Garden. A Pet-friendly Break in Keswick. When planning a break with your four-legged friend , it is always handy to know that one particular Lake District resort has been voted ‘Uk’s Most Dog Friendly Town’ by the Kennel Club for four years on the trot. Lovely Keswick has it all. 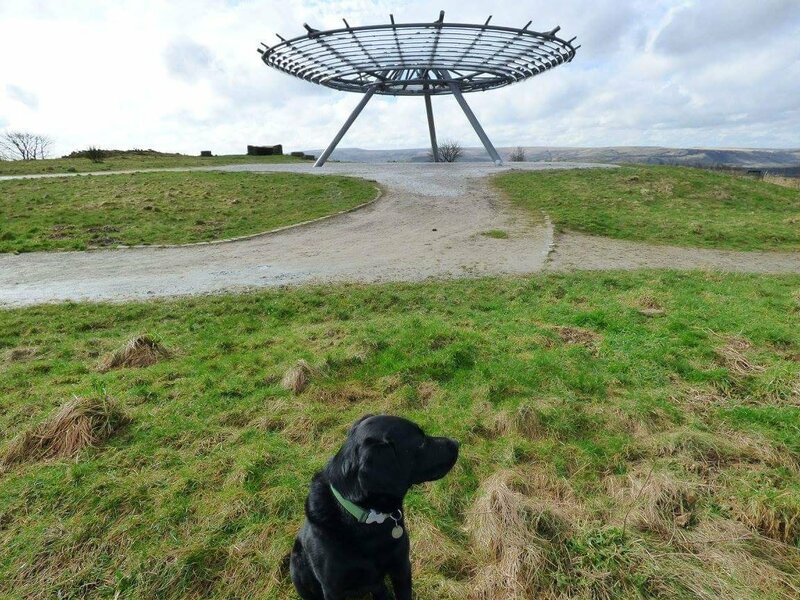 Stunning countryside with miles and miles of walks, a beautiful lake ( Derwentwater), cosy pubs and cafes, eclectic shops , several dog-friendly parks and a variety of accommodation and visitor attractions that welcome waggy tails. It seemed the ‘Pawfect’ place for a January Break with our labrador Hugo. 🙂 Here’s what we got up to…. Where we stopped. We booked Butterfly Cottage through Sally’s Cottages who are based in Keswick. 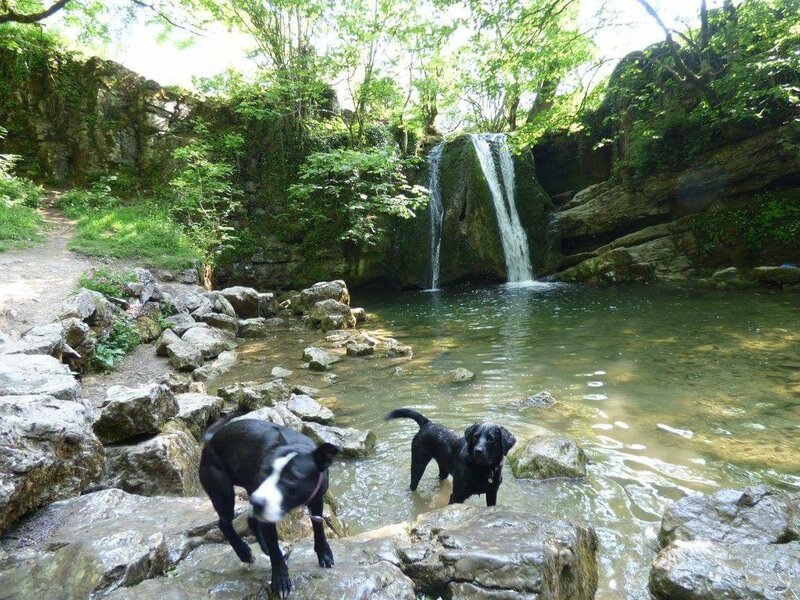 They have over 230 pet friendly holiday cottages in The Lake District and Cumbria. Our bijou retreat was so cosy with its Wood Burning Stove ( a must for a Winter Break), open plan downstairs space, fully equipped kitchen and beautiful bedroom with comfy King Size Bed. The location was really handy for everything in town and it was super useful to have an enclosed back yard with a muddy boots and paws wash.
Where we walked. Every morning before breakfast we headed to Crow Park on the banks of Derwent Water. This is one of three Dog Friendly Parks in Keswick that we noticed. The others are Hope park and Fitz Park. Each morning depending on the weather, the scenery changed. Sometimes the mountains were bathed in gold, sometimes they were an angry slate blue. It was peaceful there and Hugo had a great run around. There is a ten mile circular walk around Derwent Water itself which we hope to try on our next visit. We did however revisit a Railway walk which we enjoyed whilst camping in Keswick a couple of years ago. The Keswick to Threlkeld Railway Path is now partially destroyed due to last Winter’s storms but what remains, still makes for a pleasant stroll or bike ride. The walk starts from the Swimming Baths near Fitz Park. We also walked up to Castlerigg Stone Circle situated just outside of Keswick off Castle lane. With the mountains of Helvellyn and High Street as a backdrop, the stone circle is among the earliest in Britain, dating back to 3000 BC. On a clearer day the views are stunning. Many of the pubs serve great food ( try the Royal Oak for their amazing Cheese Boards & Platters) and there are plenty of cafes and restaurants in Keswick that welcome dogs. As well as Bar 26 and Merienda look out for The Square Orange Bar/Cafe, Java Chocolate & Coffee Shop, Lakes Bistro & Bar, The Filling Station, Little Chamonix, Laura in The lakes, Kat’s Kitchen ( Veggie ) and Mrs F’s Fine Food emporium, to name but a few. Shopping. Plenty of shops in the town don’t mind you being accompanied by your four legged friend. I find the best thing to do is always ask first. Lots of the Outdoorsy shops are dog friendly and so are many others. Hugo visited lovely gift emporiums Cherrydidi and Love The lakes on St John’s Street, for holiday souvenirs. He also bobbed into Keswick’s well loved Pet Store Podgy Paws which is a great place to visit for advice on local walks and dog friendly places, activities and attractions. Castlerigg Stone Circle. Near Goosewell Farm. Can you recommend any dog friendly destinations?